Written by Christopher Beaubien • June 03, 2008 • Start the Discussion! The Criterion Collection, the best in restoring and packaging obscure films, has postponed the release of the Paul Schrader masterpiece Mishima: A Life in Four Chapters (#432, 1985). 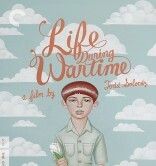 It was originally slated for June 17th, but will now be released on July 1st. The reason for this could be so the Director-approved 2-disc special edition can coincide with another Criterion release Patriotism (#433, 1966), a 29-minute film directed by and starring Yukio Mishima. 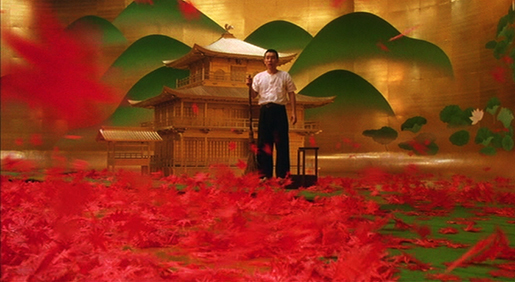 Mishima is one of my favorite films of all time right behind Terrance Malick’s Days of Heaven (1978). It is one of the most strangest and artistically appropriate biopics about a deeply-complex and passionate man. Yukio Mishima (Ken Ogata, The Pillow Book, 1996), a quiet novelist and arguably insane radical who wrote dozens of stories about struggle, beauty, sexuality, love, suicide, and the importance of an artistic statement. He later formed a personal army in pursuit of more tradition livelihood in Tokyo. Three of his most renowned stories The Temple of the Golden Pavilion (1956), Kyoko’s House (1959) and Runaway Horses (1968) were shot in rich, gorgeous color on eye-popping theatrical sets by Eiko Ishioka that compliment the black-and-white scenes chronicling the writer’s past. They are the best filmed expressions of the writing process matched by Spike Jonze’s Adaptation (2002). These passages of past and fiction all lead up to Mishima’s last day, shot like a documentary in color, when he committed a rehearsed act of seppuku – a form of ritualistic samurai suicide – in the headquarters of Japan Self-Defense Forces. At the 1985 Cannes Film Festival, the film’s cinematographer John Bailey (The Anniversary Party, 2001), composer Philip Glass (A Brief History of Time, 1991), and costume/set designer Eiko Ishioka (The Fall, 2008) won the well deserved Best Artistic Contribution. 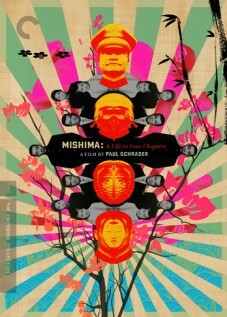 Director Paul Schrader, the writer of Taxi DriverAffliction (1998) has recognized Mishima as his best work. (1976) and director of Francis Ford Coppola and George Lucas co-produced it knowing that the financial venture wold not be profitable because mainstream audience would not embrace it despite critical acclaim. Luckily for those who appreciate challenging and expertly-made films, Mishima: A Life in Four Chapters can be experienced because it exists. 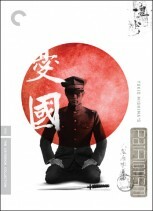 Warner Bros Home Video released a DVD of Mishima on August 2001 that included a director’s audio commentary. It is currently out of print. The Criterion release will sport a new, restored high-definition digital transfer of the director’s cut which was supervised and approved by director Paul Schrader and cinematographer John Bailey. The changes of the director’s cut include a deleted scene featuring Chishu Ryu, a favored actor of Yasujiro Ozu (Floating Weeds, 1959). For Ozu fanatics, you can read a Sight and Sound article by Ryu on the director here. 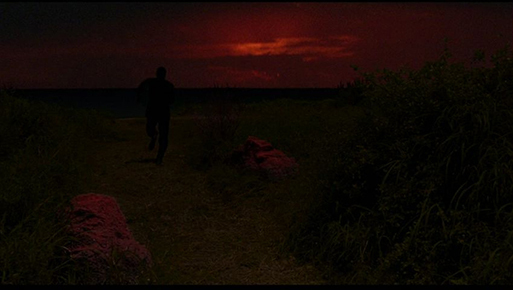 Another change to film is a digital replacement of a blue skyline with a blood red one in the Runaway Horses segment because Schrader wanted it look artificially in sync with the rest of the story visually. Optional English and Japanese voice-over narrations will also be provided; the former by Roy Scheider (“We’re goin’ to need a bigger boat.”), the latter by Ken Ogata. New special features include: an audio commentary featuring Schrader and producer Alan Poul – the one featured in the original Warner release will not be included. There will be new video interviews with Bailey, producers Tom Luddy and Mata Yamamoto, composer Philip Glass, and production designer Eiko Ishioka. Mishima biographer John Nathan and friend Donald Richie will also have video interviews. A new audio interview with the co-screenwriter Chieko Schrader who wrote the Japanese dialogue was the wife of Leonard Schrader who also wrote for Mishima as well. Another video interview excerpt will feature Mishima talking about writing. Also included is The Strange Case of Yukio Mishima, a 55-minute BBC documentary about the author, the film’s theatrical trailer, and a booklet featuring a new essay by critic Kevin Jackson, a piece on the film’s censorship in Japan, and photographs of Ishioka’s sets. Available separately on the same date is Yukio Mishima’s Patriotism, which foreshadowed his death playing an officer who commits seppuku. The original film was thought to be destroyed by Japanese authorities shortly after Mishima’s death, seen as a plight upon the nation. Fortunately, the original negative was saved and has resurfaced 35 years later. The DVD will be restored in a high-definition digital transfer of both the Japanese and English versions, with optional Japanese or English subtitles. Special features include a 45-minute audio recording of Yukio Mishima speaking to the Foreign Correspondents’ Association of Japan; a 45-minute making-of documentary, featuring crew from the film’s production; interview excerpts featuring Mishima discussing war and death; new and improved English subtitle translation, and a new essay by renowned critic and historian Tony Rayns, Mishima’s original short story, and Mishima’s extensive notes on the film’s production. I’ll be picking them both up July 1st.